Its all pretty good but let's be honest, this is basically a clone of of what Facebook already have. 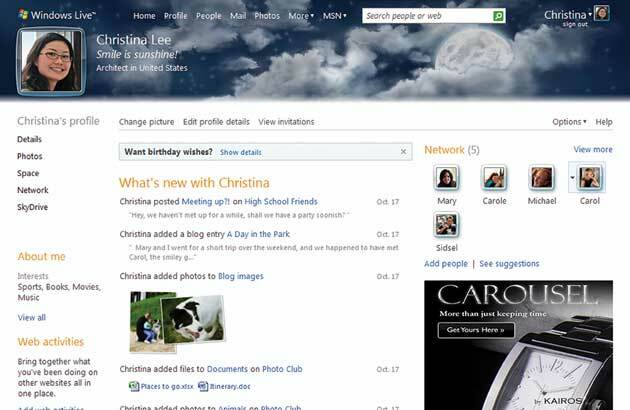 Given Facebook's popularity though Microsoft didn't really have a choice but to copy them. If Microsoft really want to differentiate themselves in this arena then one option would be to provide avenues for interacting with other online services such as Flickr, Twitter, Jaiku, Pownce, etc... This list could then become an aggregator for all online activity and that's a pretty compelling scenario. One really quick win in this area would be to capture any blog entry that is posted from Live Writer, regardless of whether it is posted to Live Spaces or not. Turning the idea on its head...it would be cool to be able to publish the activity list on other sites such as MySpace, Bebo and (them again) Facebook. It isn’t often that you can get such complete feedback from one of your customers and then turn around and say you implemented every feature they asked for. From the list of 15 suggested activities to add to the feed above, I’d say about half either now show up in the feed today or will soon show up. The rest won’t either because the service is being deprecated (e.g. Live Expo being wound down) or we explicitly decided that notifications on that change didn’t seem particularly relevant (e.g. notifications when someone you know downloads a file off of SkyDrive). Besides the features Jamie asked for we added one more that seems obvious in hindsight; an Atom feed of the updates from your social network so you can keep up to date with your social network from your favorite feed reader. Thanks to this feature we satisfied another recent request from Jamie and there is now a Vista gadget that can be used to consume your What's New feed directly from your desktop. Both the gadget and Atom feed feature were the results of dev work by our 2008 summer interns. As I mentioned on Twitter a few months ago I suspect many of my readers will appreciate their output. We also enable our users to aggregate their online activity in a single place and then share it with their friends. For example, if you go to my Windows Live profile you’ll see that I’ve aggregated my activities from Twitter, Pandora, StumbleUpon,and my personal weblog onto my Windows Live profile which will then show up on the What’s New page of my friends in Windows Live. Activities can be aggregated from a number of other sites including Flickr, Flixster, PhotoBucket, Yelp, iLike, blogs hosted on Wordpress.com and a bunch of other sites with more to come in the future. Of course, you can just import a regular old RSS or Atom feed as well. Although this functionality started out as a feature of Windows Live Spaces, it soon became clear that this feature really should be a “Windows Live” feature. This means it is deeply integrated into all of the major Windows Live products including desktop applications like Windows Live Messenger and the Windows Live Toolbar. 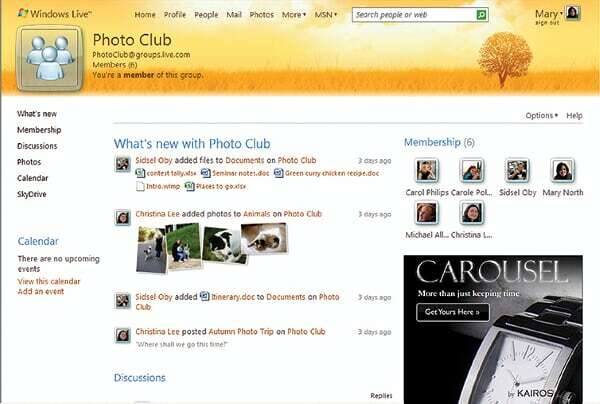 Also there are a ton of revamped Windows Live web experiences that pivot around the What's New list such as the Home, Photos, Groups and the Profile pages. At the end of last year, the main problem it seemed we had to tackle was making it easier for other Windows Live and/or Microsoft product teams to plug into the What's New feed on Windows Live Spaces. However the list of teams interested in the feed continued to grow as did the number of feature requests we got the more we talked to people about it. Once we saw all the new requirements for the feature at the beginning of this year and started doing the math on what it would take to support on the order of hundreds of millions people using this feature and handling billions of transactions a day it quickly became clear we had to redesign from scratch. In the words of Frederick Brooks, build one to throw away – you will anyway. It has been a grueling but fun year getting the platform out and it feels great to see millions of people enjoying our handiwork. This should explain my interest in Twitter’s scaling problems earlier this year since a micro blogging service with a model of followers and an open API is in the same problem space as providing a news feed that supports activity aggregation on a social networking site. Building a system to support over 280 million Hotmail users, 260 million Messenger users and around 120 million Spaces users from scratch has been a helluva thing. We've definitely pulled all of the scaling tricks out of the bag including my favorite trio of Dark Launches, Gradual Ramps and Isolation. Much love to everyone who made this happen; Hammad, Brad B, Austin, Derrick, Peter, Paul, Badriddine, John, and Kyle. You guys were a killer dev & test team (the interns included). We also had great support from our leads Mike P, Inder & Diego. Our ops folks were incredible, I owe you all a big hug; Srdjan, Curtis, David G (deserter!!! *smile* ), Scott R, Keith, William, Eric, Ziad, Teri, Michael, and Edet. Props to Kerstin, Sharad, Suresh, Alpesh and everyone else who made the aggregation experience shine on the platform end. Thanks to all the UX folks who touched or were touched by this feature including Miriam, David L, Jeff, Lavinder, Douc, Hua, Stacey, Vlad, Alton, Chad, Edgar, Colin, Jennifer, Omar, Mike, Shu, Michelle, Chris, Jason, Scott S, Chuck, Ben, Khalid, Deepa, Rob (my partner in crime – we worked on this so closely I have him on speed dial on my cell phone) and a ton of other folks on the Windows Live Experience team, you guys rock. And finally thanks to all the management folks that were super supportive; Ramesh, Russ, Chris, Tread, Ben and Debra. Without you guys none of this would have happened. Damn, I love working here. PS: Brandon, I hope you like this release. PPS: By the way, we're hiring and are looking for a few good operations folks, developers and testers who wouldn't mind spending their days building services that are used by tens of millions of people every single day. Send me your resume if interested.